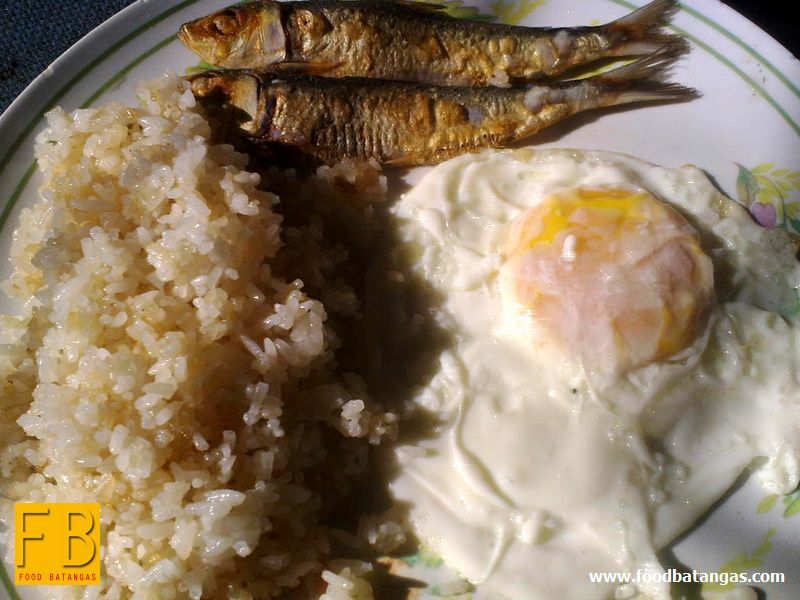 The age-old marriage between sinangag (fried rice) and pritong itlog (egg fried sunny side up) has always been, to my mind, the proverbial made-in-Heaven. In the old days, when there was nothing else inside the fridge, the two would suffice for breakfast; albeit, generously splattered with ketchup. 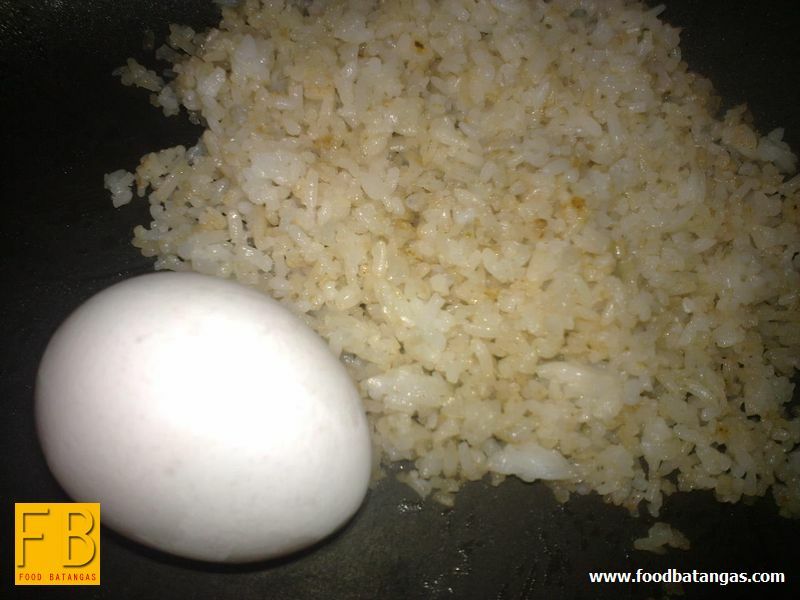 Freshly cooked rice and egg – well, this combination has simply never worked for me. The glands inside my mouth just loudly cry out “bland.” Perhaps, my mind was just conditioned early to associate fried egg with fried rice, who knows? The rice just has to be fried; preferably with finely chopped crispy garlic but just as fine plain. As sayings go, the cliché “three’s a crowd” just does not apply. If anything, a third party always enhances the fried rice and fried egg combination in a delectable ménage à trois. Hence, we all have come to recognize these by-now iconic silog combinations. The names were just marketing inventions. Truth be told, we have always been combining all sorts of viands to go with fried egg and rice; and mostly but not exclusively for breakfast. Below is a pictorial summary of the more familiar combinations that have been gracing Filipino tables for ages. Some of the names are commercially used; the others I just invented. For tapa-sinangag-itlog. For non-Pinoys, tapa is cured lean meat, usually beef or pork. Mom used to talk about tapang usa (deer), which I never tasted; but then, I don’t believe there were a lot of those still left in the gubat even when I was a child. At any rate, I have always loved Mom’s formula for tapa which was cured with just soy sauce, vinegar, garlic and black pepper; then left to dry under the sun for at least half a day. For hawot-sinangag-itlog. I don’t really think you see this combination commercially because the hawot – tuyô to non-Batangueños – is so ubiquitous. I am picky about my hawot and I do not just buy the usual severely emaciated tonsoys off the supermarket racks. I prefer my hawot with a bit of flesh and I do not like dipping this into vinegar as many people do. For tinapa-sinangag-itlog. Tinapa is smoked fish; and while we occasionally find galunggong (scad) smoked, most of us Pinoys would be more familiar with smoked varieties of sardines. 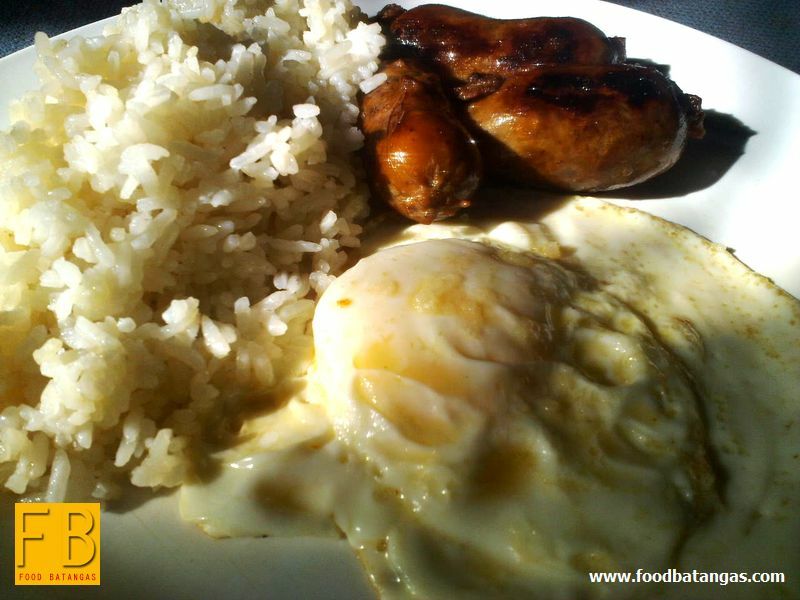 I have always thought that the classic tinsilog should always be served with a dip made of soy sauce and calamansî. For adobo-sinangag-itlog. 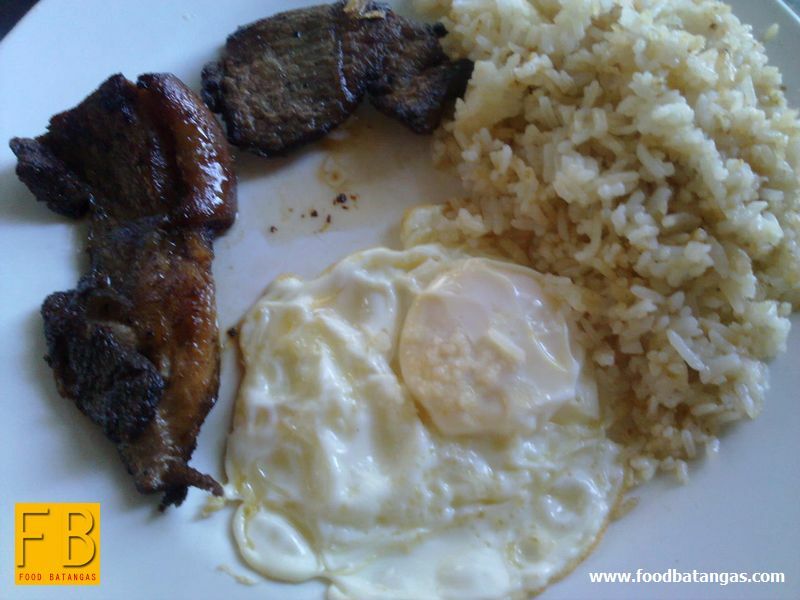 I have seen this combination served in restaurants; and personally, this is my favourite among the silog variants. I do love my adobo dry although I do not really mind the sort with a bit of sauce still left in it. At home, adosilog is usually served with adobo left over from the night before; and as every Pinoy knows, adobo is always better the day after. For danggit-sinangag-itlog. Danggit is rabbitfish or spinefoot in English. I am sure that my Mom had another name for it; although try as I would, I cannot for the moment recall it. At any rate, for the dangsilog, I do not mind a dip of vinegar and some crushed garlic. For tocino-sinangag-itlog. I have also seen this combination served in restaurants. I cannot say that this now ranks among my favourites because, these days, I prefer salty food for breakfast. I did love the tocino when I was much younger. By the way, the tocino in the picture is of the commercially available Pampanga variety. Take your pick: hotdog-sinangag-itlog or frankfurter-sinangag-itlog. I used to have this ever-so-often at the school cafeteria; which did not have a lot in the way of choices to begin with. Not exactly your most palate-titillating of the silog combinations and more of the laman-bituka sort to start an equally unexciting routinary work day. For pusit-sinangag-itlog. Dried squid, in other words. I love this combination; but I do not have this as frequently as the others because chewing on the squid can be a bit of a challenge. Not to mention that if fried crisp, the sharp edges can also be unkind to the gums and tongue. Other than this, the dried squid is really quite delicious. This is sinangag and itlog with a local sausage, the longganisa. This is readily available in most local restaurants; although one is more likely to find the sweet longganisa which I can eat but only if there other one is unavailable. By ‘other one,’ I refer to the garlicky longganisa as is made in Taal, Lucban or Vigan. The Taal longganisa, in particular, because it is larger. Fact is, we probably make up so many more variants of the silog combinations but have just not thought up names for these. Oh, well... Guess you’re off to the supermarket now, eh? If you’re living abroad, don’t blame me if there isn’t a Filipino or Asian store in the neighbourhood.